We’ve seen a frothy tidal wave of new breweries opening across Los Angeles in recent years, but the growth of the city’s craft spirits scene has been decidedly slower, especially compared to other cities. But that’s quickly changing thanks in large part to pioneering spirits-maker Greenbar Distillery -- which opened its Arts District headquarters in 2012 as the first distillery in LA since the repeal of Prohibition. Over the past decade, Greenbar has worked to overcome many of the antiquated laws and other obstacles that stood in the way of distilleries opening in the city and state, paving the way for other contenders in an emerging craft-distillery scene. Like any good venture, Greenbar started off not with a business plan, but with a love story. Over 14 years ago, a newly engaged Melkon Khosrovian and Litty Matthew -- who met while both were attending USC, pursuing their masters in journalism -- began spending time with each other's families. For Melkon's Armenian family, ceremonial toasts with vodka or fruit brandies were made frequently throughout a meal, but to Litty that liquor tasted like jet fuel. Noticing her best efforts not to appear rude, Melkon was inspired to create liquor infusions that were more palatable to his fiancé for the gatherings. During their regular trips to the farmers market -- Litty is a Cordon Bleu-trained chef and food writer -- Melkon would gather fresh fruits and herbs to create infusions that Litty could enjoy at the family gatherings. He even went so far as to affix beautiful handmade labels on the bottles, so his family would think they brought something fancy. It worked. Not only was Litty able to fully participate in the toasts, but Melkon’s family members began to enjoy the homemade infusions so much that they began asking for bottles that they could take home. Pretty soon word spread of these flavorful concoctions and the couple began receiving calls from friends of Melkon’s cousins and friends of friends who wanted to order bottles of their own. The couple soon found themselves working late into the night after their day jobs just to keep up with demand. "We finally had that moment where we had to either get our number unlisted or go into business,” Melkon admits. “So, we took the idea of what we had done with our friends and relatives and decided to open it up to the world because there was something missing -- spirits that had the flavor of food. Anything [on the market] that had flavor tasted like floor cleaner or cough syrup. And this approach really lent itself to cocktail making because the flavors were rich and deep. When you would go to make cocktails that meant you could make simple drinks that tasted anything but simple." Once Melkon and Litty decided to embrace their newfound calling, the next step was to find someplace -- other than their kitchen -- where they could produce their infusions on a large-scale. The step proved more difficult than expected. For the following several years, the couple was able to grow their business from a warehouse in Monrovia, thanks in part to guidance from the city. At the time, they didn’t yet have the equipment or space to distill their own base spirits, and so they would buy pre-distilled neutral spirits, and infuse (or rectify) them with local produce -- a fairly common practice in the industry. And while they sourced their ingredients locally, they hadn’t yet become the organic spirits producer they are today. 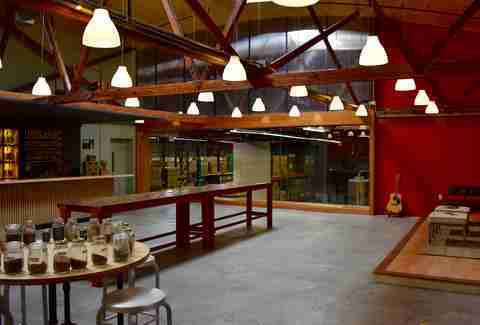 In 2012, Greenbar Distillery began operating in a 14,000sqft warehouse in the Arts District, just over the tracks from the LA River and within sight of the 10 freeway. With the larger space and guidance from the city, they were finally able to begin distilling their own base spirits. But despite the city’s guidance, they still ran into obstacles, including challenges from the county. 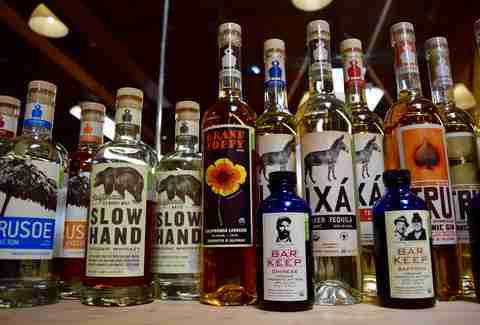 Greenbar and other California craft distillers also faced the challenge of archaic laws that kept them from offering on-site tastings and direct sales to customers. After the repeal of Prohibition in 1933, a “three-tier” system was created to separate the production, distribution, and retail sales of alcohol to avoid monopolies. And while California has since created exceptions to this system to allow wineries and breweries to offer tastings and sell on site -- distilleries weren’t allowed to do so. (One other exception was fruit-based brandy producers who could sell, but not offer tastings). Meanwhile states that overturned these restrictions on distilleries have seen their craft spirits industry flourish. Thankfully big changes have taken place to help free up the craft spirit industry just in the past few years, thanks in large part to the efforts of the CADG and passionate distilleries like Greenbar. In 2013, Governor Brown signed AB 933 into law, which allowed distilleries to offer tastings for a fee. In the bill, the tastings were restricted to six per customer and each sample could only be a quarter of an ounce. It was a watered-down version of what CADG had initially proposed -- which also included allowing direct sales to customers -- but it was an important victory in a long fought battle nonetheless. Then in 2015, craft distillers in the state had another victory with the passage of AB 1295, which enables spirit makers who produce no more than 100,000 gallons per year to sell up to three bottles on-site per day. It also allows distilleries to offer tastings in the form of a cocktail instead of just straight-up samples, and for them to own a partial interest in up to three restaurants or bars, as long as long as at least one of them touches their distillery. The bill helped realize some of the other goals of CADG’s previous proposal -- including the ability of local distillers to control their brand -- much to the chagrin of California’s powerful wholesale liquor lobby, which wished to maintain more control over distribution. As Greenbar was fighting the good fight to open and operate their distillery, several others around the LA-area were looking to do the same. While some were facing their own challenges independently, others saw Greenbar as role models. "Now new distillers can have a much freer time opening and operating in L.A. County because we went through hell first,” Melkon explains. "The huge advantage has been time. We were part of the industry before 'craft distiller' was really a term. There were so few of us that it really gave us time to hone in on our skills." Melkon points out that when they first started they were one of only 10 spirit makers in the state, and thanks to the changes brought by AB 933 and 1295, along with a renewed interest in craft production, now there are over 60 in California alone. And the country now has over 1,200 craft producers up from only a few dozen when Greenbar started. Stark Spirits, the second distillery to open in LA county and the first in Pasadena, was launched in March 2013 by another husband and wife team, Greg Stark and Karen Robinson-Stark, who make rum, whiskey, aquavit, and brandy. While Greg admits that they were aware of Greenbar’s efforts, they were mostly focused on their own challenges to open their micro-distillery -- it’s less than 1,200sqft -- particularly from 11th hour demands from Pasadena’s Building and Zoning departments. Ultimately the issues were resolved, and they were happy with their decision to open in the city of Pasadena. “We heard horror stories from both breweries and distilleries’ efforts to open in Los Angeles,” Greg explains. “Each city offers its set of challenges, and for Stark Spirits the challenge today is to be able to sell spirits from the distillery like other craft distilleries throughout the county and state. The zoning at our location allows us to manufacture, but not do retail sales.” Stark Spirits recently won five medals (including a best-of-category) at this year’s American Distilling Institute’s craft spirits competition and a Gold medal at the California Craft Spirits competition for the brand’s Traditional Aquavit. 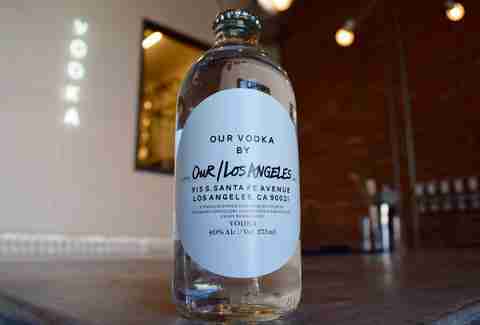 The second distillery to open up in the city of Los Angeles was YSA (Young State America) Distillery, producing the award-winning Loft & Bear vodka in, you guessed it, an Arts District loft. Founder Paul Ryan Elliott, one of the youngest distillers in the country at 31, says they were inspired by Greenbar, their neighbor down the road. “I’d say arguably that they paved the way for us newcomers,” Elliott says. 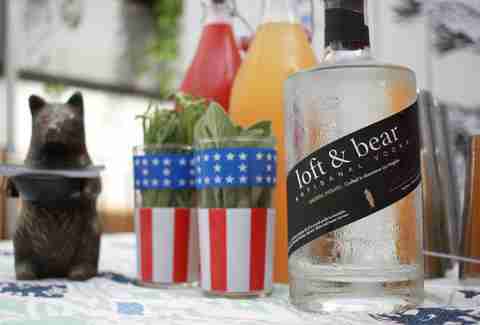 “They were the first in what’s proven for us at Loft & Bear to be a great local market with fierce local brand loyalties.” YSA continues to operate out of the Arts District, but is currently working to expand to nearby Huntington Park, where they have plans to build a much larger distillery and a tasting room. Another new neighbor of Greenbar in the Arts District is The Spirit Guild, which opened their distillery and tasting room early this summer on Mateo St. Launched by Miller Duvall and Morgan McLachlan, yet another husband and wife distilling duo, The Spirit Guild distills their two current offerings, Vapid vodka and Astral Pacific gin, from clementines grown on Miller’s sixth-generation family farm roughly 100 miles away near the Kern River. Morgan explains that they were going through similar challenges of going through the permitting process as Greenbar around the same time. “There wasn’t much of a precedent for opening a distillery with the city, so it made things a little difficult getting through permitting, and explaining to the city the intent of what we were doing,” she says. Beyond the Arts District and Pasadena, other distilleries have also sprouted up -- two in September alone -- with others in the works. Rob Rubens Distilling and Brewing recently opened in El Segundo, and further down in Orange County, Blinking Owl Distillery is opening their doors in Santa Ana. 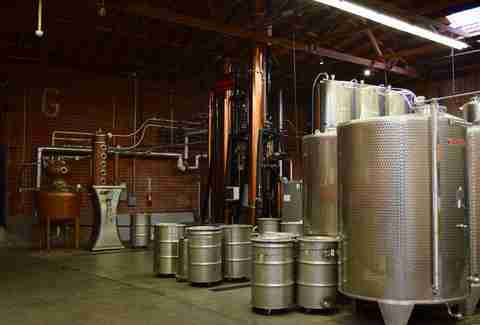 And meanwhile Ventura Spirits has been distilling California-inspired spirits to the north for several years now. Melkon and Litty -- whose current offerings include everything from vodka and barrel-aged whiskey to bitters and California-inspired liqueurs -- hope to help create an environment for different types of craft beverage producers to collectively present their offerings to the public. In addition to collaborating with other distillers, Greenbar also aims to work with brewers, winemakers, coffee roasters, and even soda-makers, to organize special events where the public has a chance to meet them all, sample their products and learn more about what they’re creating. In doing so, Melkon hopes that they can collectively create a local movement as you’ll find in cities like Portland, Seattle, Austin, or New York where people tend to be more familiar with local producers. “We haven't had that opportunity in such a big city like L.A. to really bring in the audience and educate them as a group,” Melkon says. Danny Jensen is a regular Thrillist contributor who hopes living on a distillery row is an option. Follow him to the next tasting room on Twitter and Instagram.